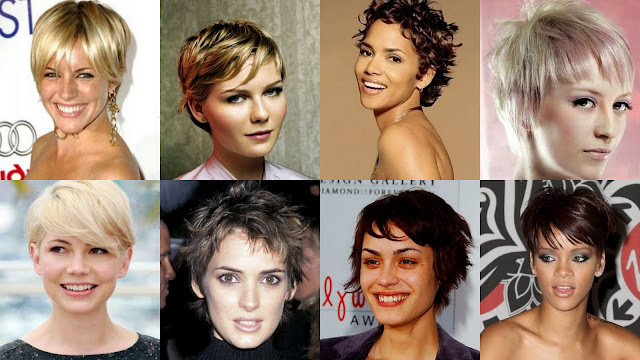 Cool, stylish, and very mod, the pixie cut is back in full swing. Celebs all over the place are chopping off their locks and opting for a more refreshing style. Now, we realize that the pixie cut is not for everyone (which Saira learned the hard way in 11th grade), so we suggest "faking" the cut by strategically pinning up your locks or, if you're Photoshop savvy, editing your locks for a mini preview before making the full commitment. The look is easy, low maintenance, and perfect for hot summer days. Once you decide to go for the cut, you'll need inspiration, so take a look! I soooo want to do this to my hair, but I too learned the hard way that um...Well, that people will think I'm a boy. :) I *love* Michelle Williams's hair though...Perhaps one day, when I actually learn how to wield a blow-dryer, I will try again.